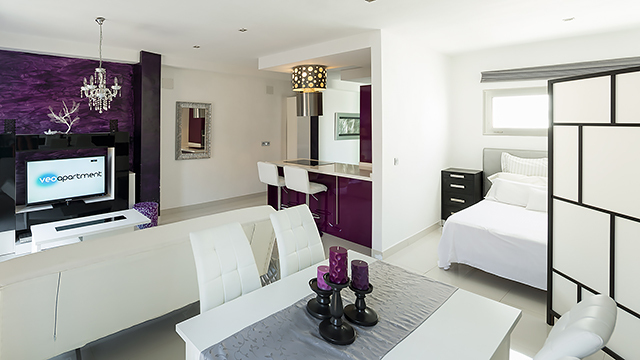 Modern, open-plan apartment for 2-4 guests. 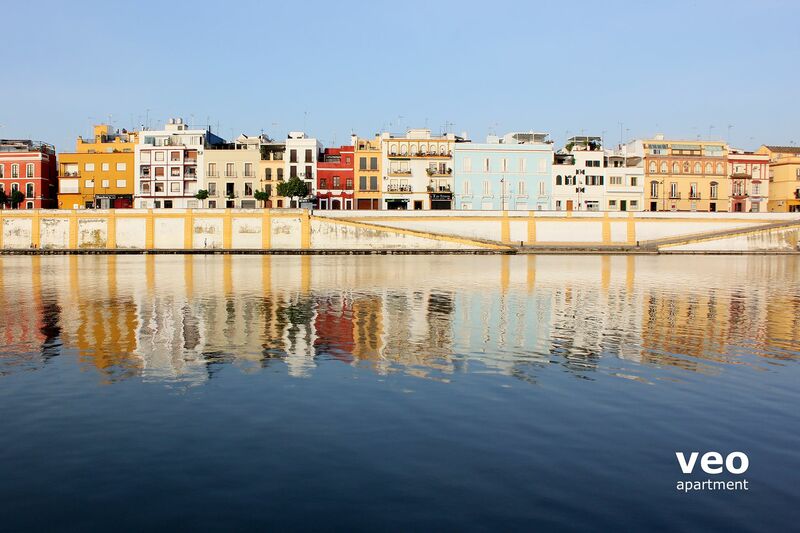 Located on picturesque calle Betis in Triana - one of the most traditional and liveliest neighbourhoods in Seville. 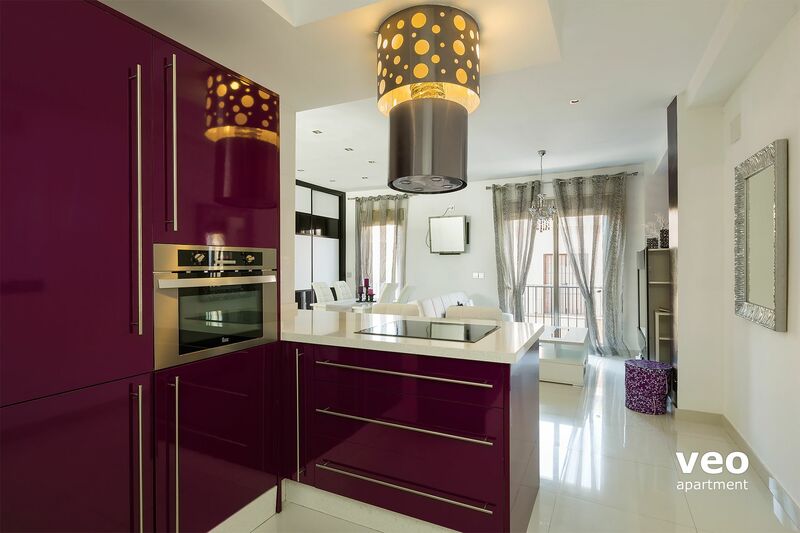 The bright interiors are decorated with furniture of contemporary design. 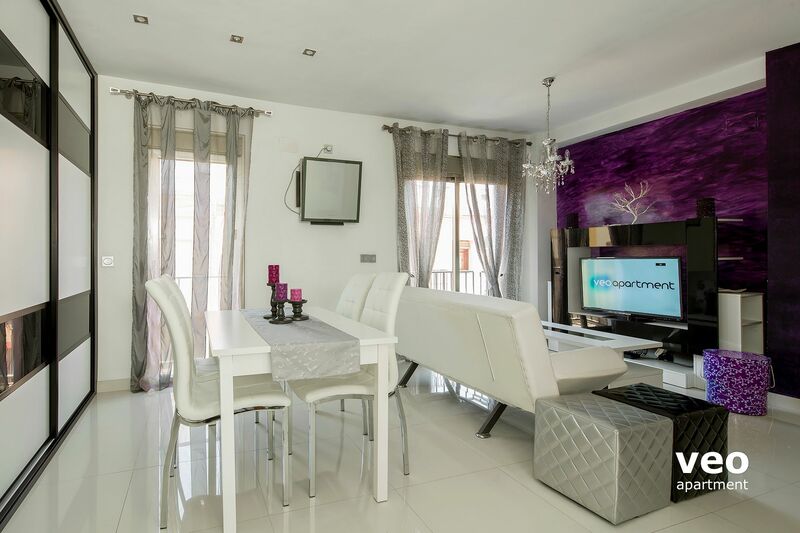 The living-dining area has a sofa (which can be used as a double bed), central table and TV. Dining table and 4 chairs. 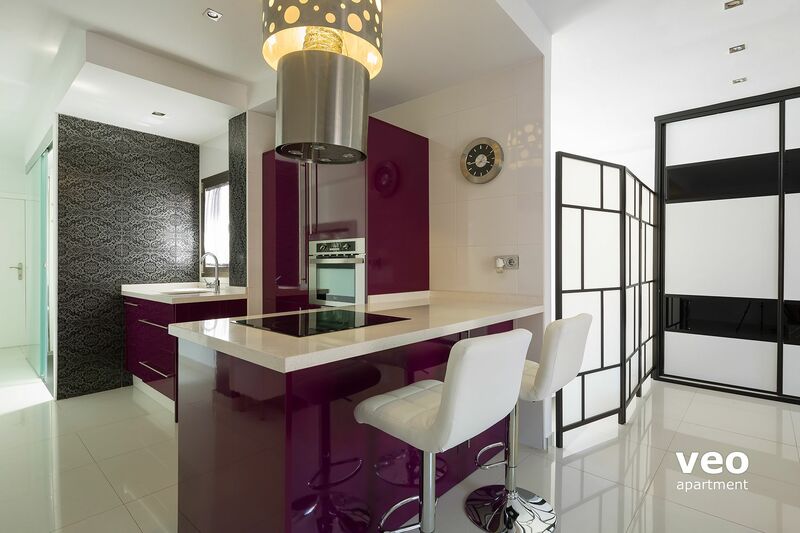 The kitchen is in the central space of the apartment. 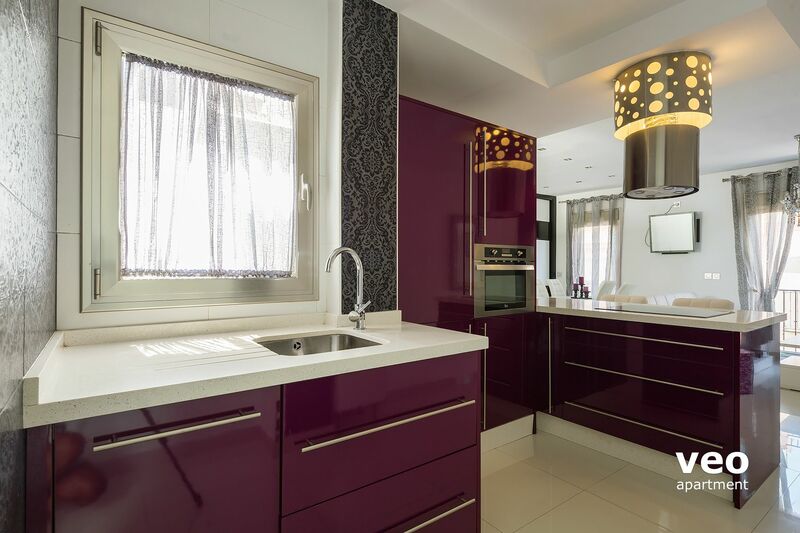 It is equipped with all main utensils and modern appliances for self-catering, including: toaster, coffee maker, vitroceramic stove, oven, dishwasher and washing machine. 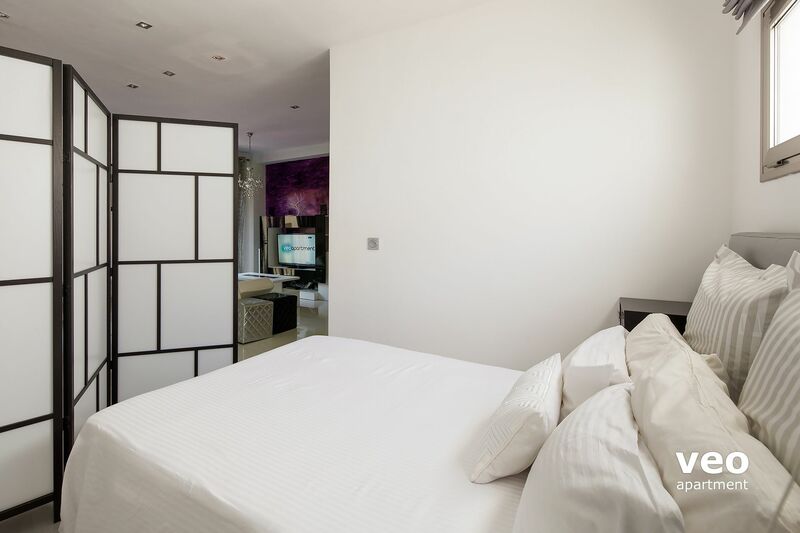 Adjacent to the living area, separated with a folding screen when required, is the bedroom with a double-bed (1.35 x 2.00m). 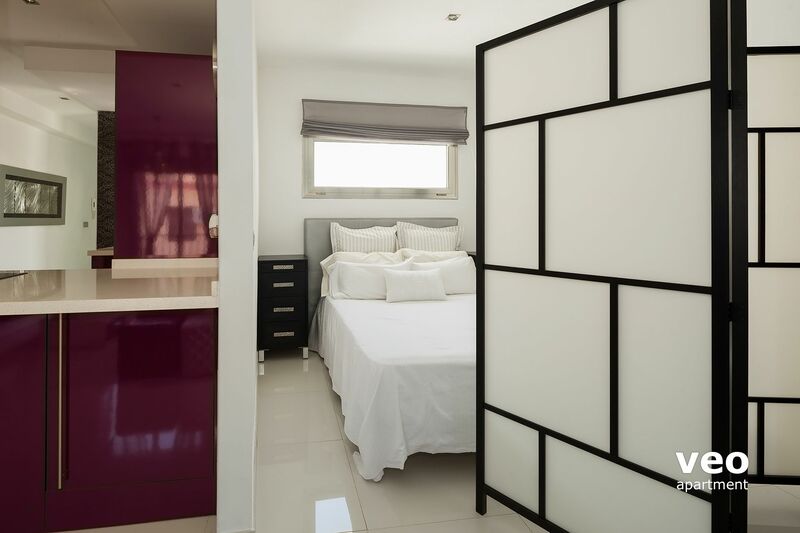 Next to the bedroom, there is a large wardrobe to store your belongings. 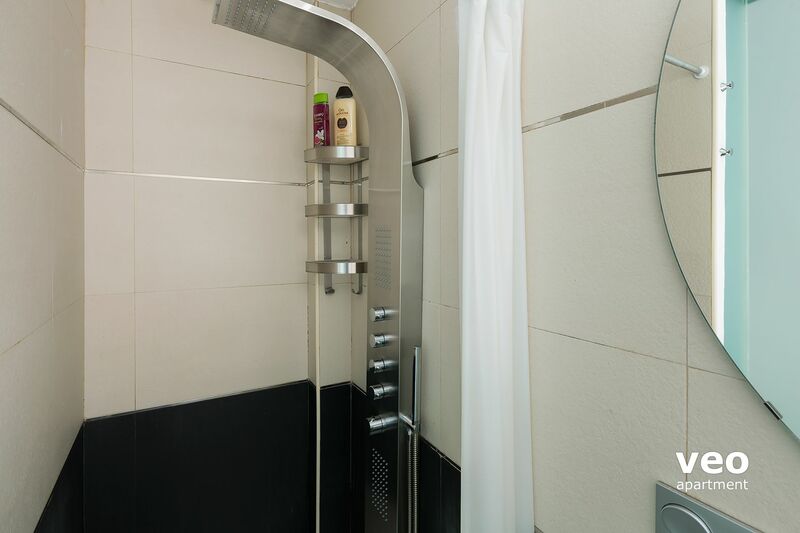 There is central air-conditioning with cooling and heating, electric roller blinds in the lounge and double glazing. Free Wi-Fi internet access. The apartment is on the 3rd floor of a residential building. 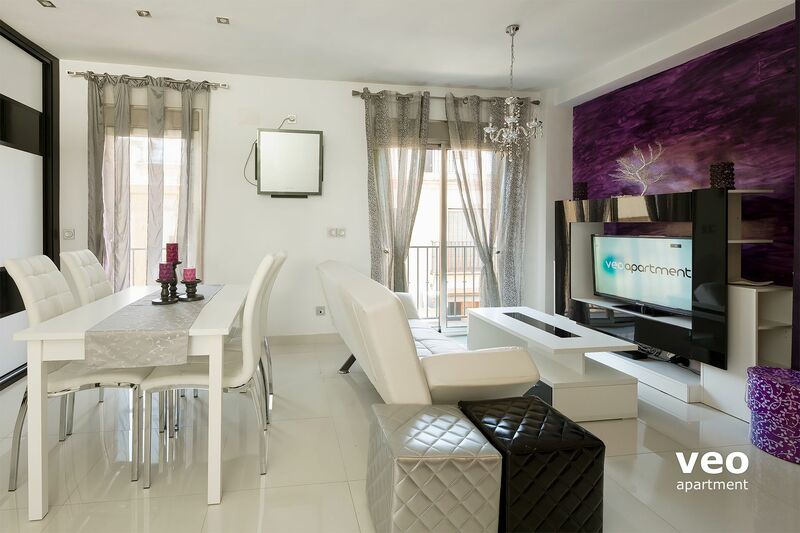 The windows give on to Pureza street, however the apartment entrance is on calle Betis. 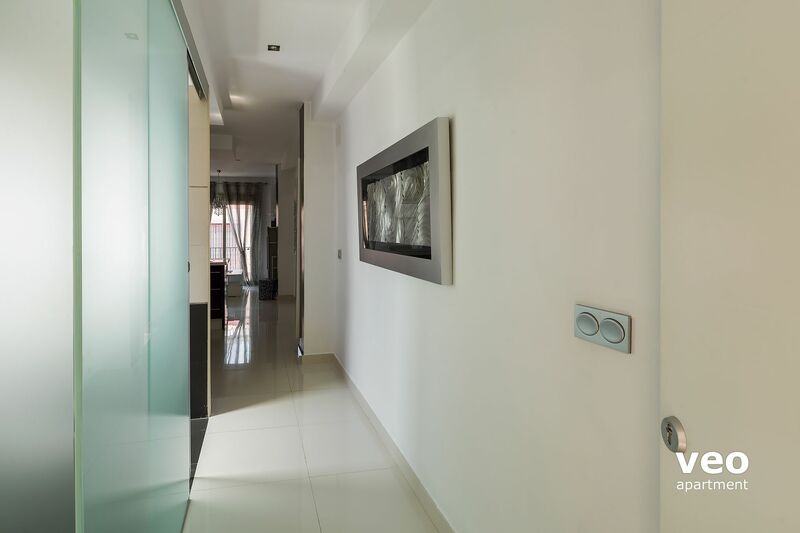 Due to this layout, the apartment though without river views, has the advantage of a quiet location. 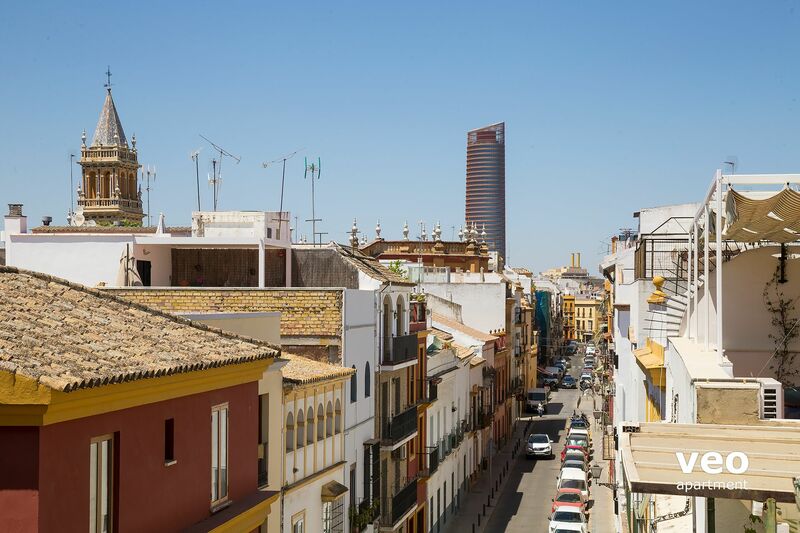 Views from Betis street include some of Seville's most famous landmarks: Triana Bridge, La Maestranza bullfighting arena, the Torre del Oro and the Cathedral tower - La Giralda. Daily rate: EUR 15. Reduced price at car park "Mercado de Triana". 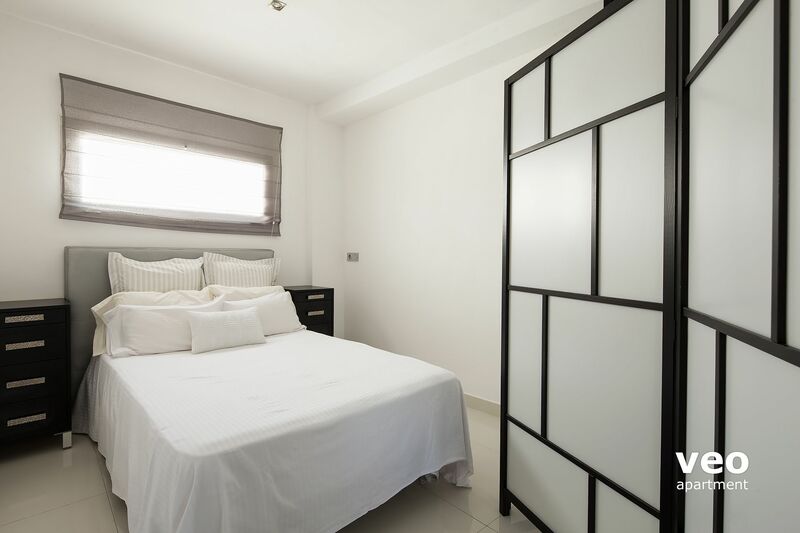 Located at 250 m from the apartment. Reservation by email required. 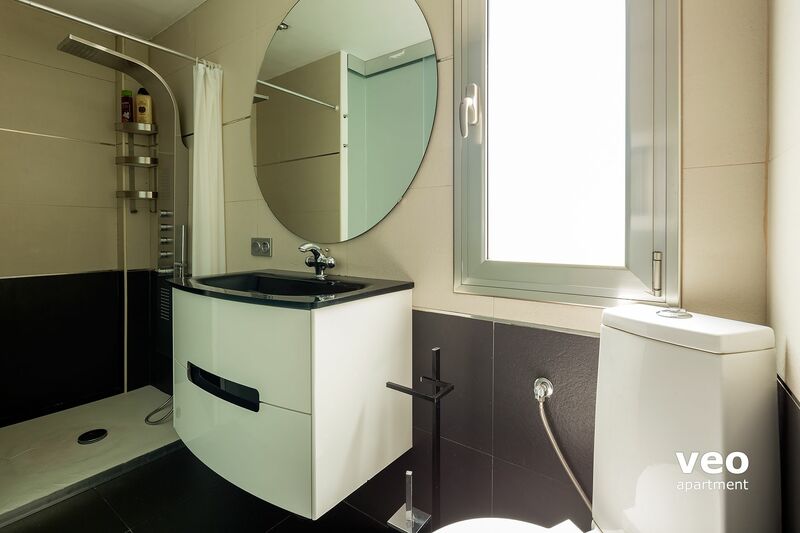 "Bien situé et relativement calme"
Appartement fonctionnel même s'il manquait quelques commodités comme des linges à vaisselle, linges de nettoyage dans la cuisine, tapis de bain et supports à serviette. 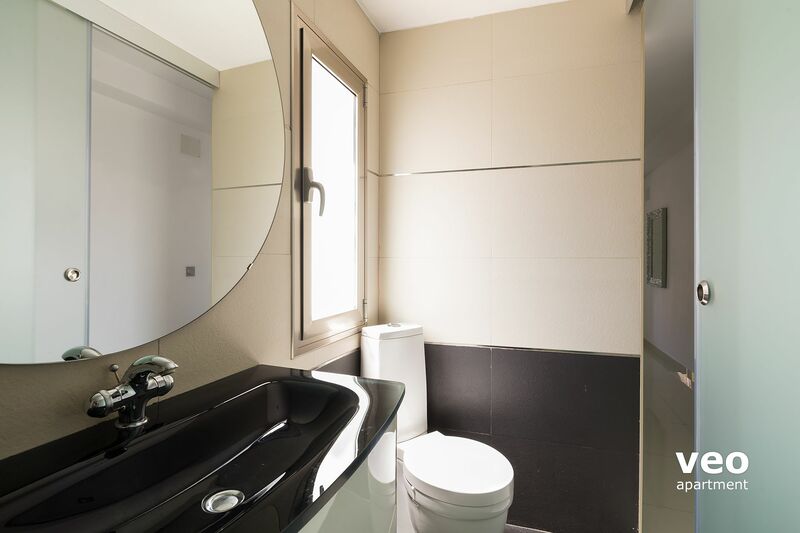 Un apartamento, muy bonito y limpio, con todo lo necesario para una maravillosa estancia, situado en el lugar perfecto, sin duda repetiremos siempre que viajemos a Sevilla. 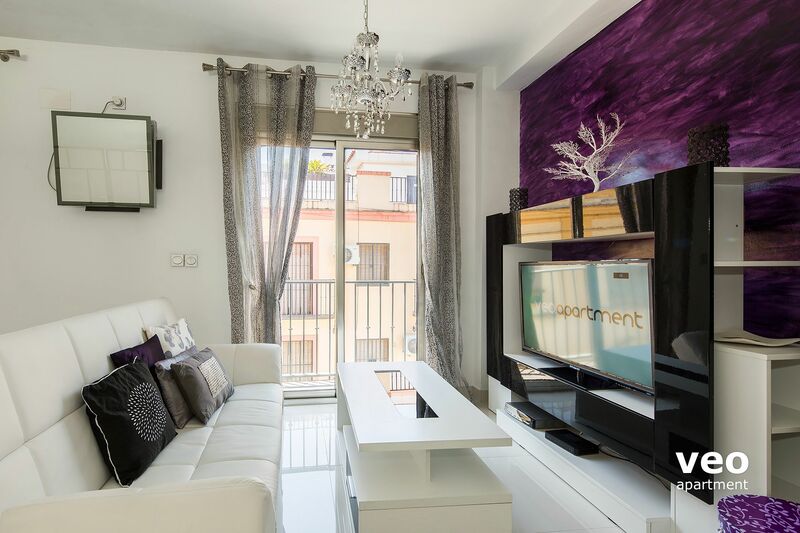 "Un apartamento práctico, moderno y situado en un sitio excelente"
En general el apartamento es fantástico y satisfizo todas nuestras necesidades. Está situado en un sitio excelente. El hecho de que no tuviera ascensor fue un punto negativo en nuestro caso ya que llevabamos maletas grandes y pesadas. 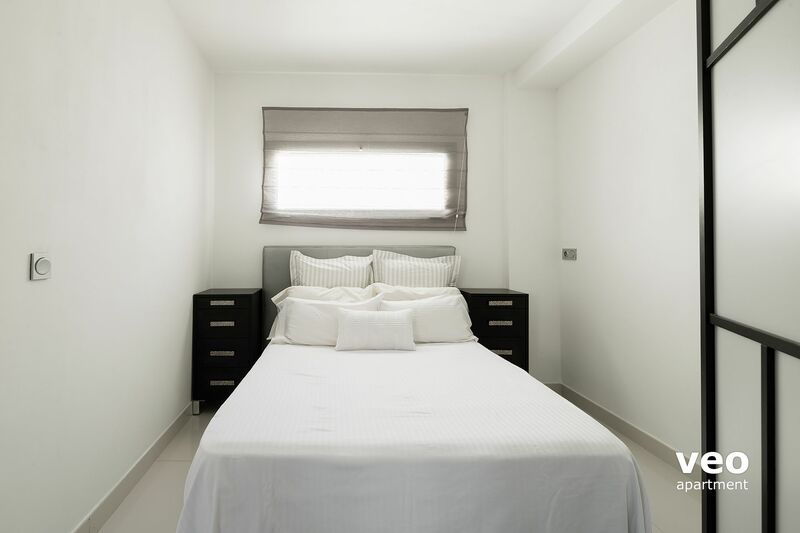 Otros aspectos que pensamos podrían mejorar la calidad del apartamento son: la calidad de la cama que no es muy cómoda, el incluir información acerca de cómo utilizar el horno, lavadora, calefacción etc y quizás el mejorar los suministros de jabón de ducha, etc. 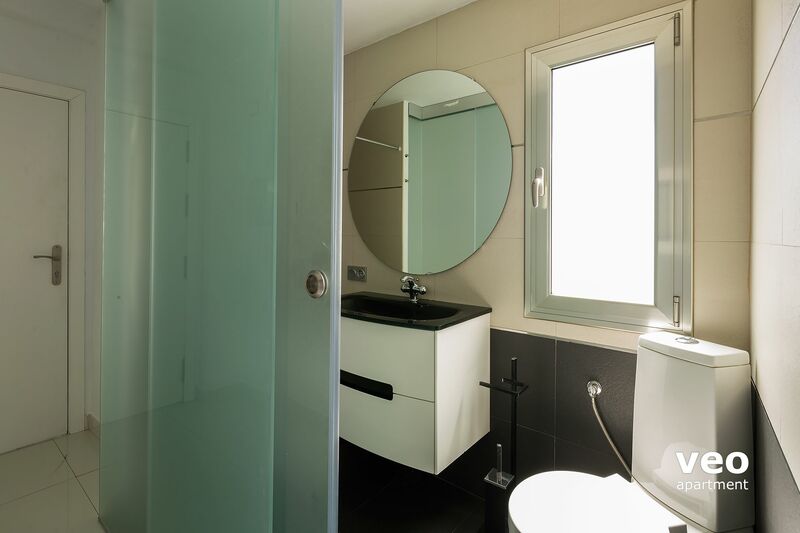 Otro aspecto que podría mejorarse en el apartamento es la condición de la cortina y la silicona de la ducha que ambos muestran algo de moho. Por lo demás el apartamento es excelente y el servicio ofrecido tanto por la agencia y Rosario, la señorita que nos atendió y entregó las llaves fue excelente. No dudariamos en recomendar este apartamento y los servicios de la agencia Veoapartament. Generally speaking the apartment is lovely and it satisfied all our needs. The fact that the building lacks an elevator wasn´t ideal for us since we had large and heavy suitcases. The bed wasn´t very comfortable, and we would have appreciated to have had access to information about the use of the oven, washing machine, heating, etc. At this stage the shower silicone and curtain are showing a bit of mold. These issues were not major problems though and regardless of the above comments, the apartment is great and the service we received from the company and Rosario, the lovely lady who gave us the keys, was fantastic. 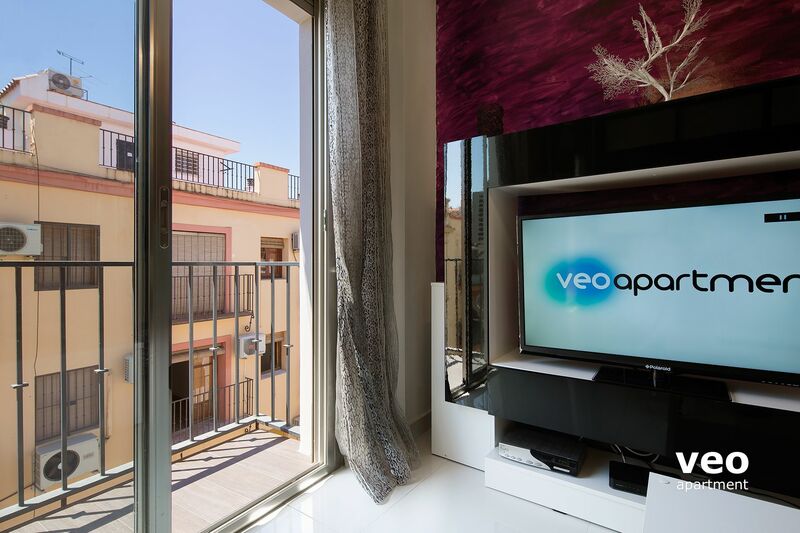 We wouldn´t hesitate to recommend this apartment and the services offered by the Agency Veoapartment. "La perle en plein centre !!!!!!!!!!!" "Good place with good view." It was at the third floor which make a bit difficult to reach it if you have luggage. The internet was bery good and fast ,regarding to the price I feel it was a bit expensive. "Estupendo sitio y trato por parte de los propietarios"
La máxima. Por ponerle un defecto: es un piso 3º sin ascensor...pero no pasa nada. "Very quiet and pleasant acommodation"
Acommodation in a nice ambient. Cómodo, práctico, tranquilo y muy bien situado. "Todo tal y como se veia en las fotos." Muy satisfecha con el trato recibido y contenta de haber escogido este apartamento. Muy comodo y acogedor.